It’s Year 5 of the #100DayProject, and for creators, it’s another chance, another challenge. Social media feeds grow more alive and active, featuring artistic pursuits from people all over the world taking on the 100-day habit. I, for one, live for it. Everyday projects are awesome, full stop. And for readers like myself, it’s even more so when it’s about books. Enter the #100BookScenesProject. 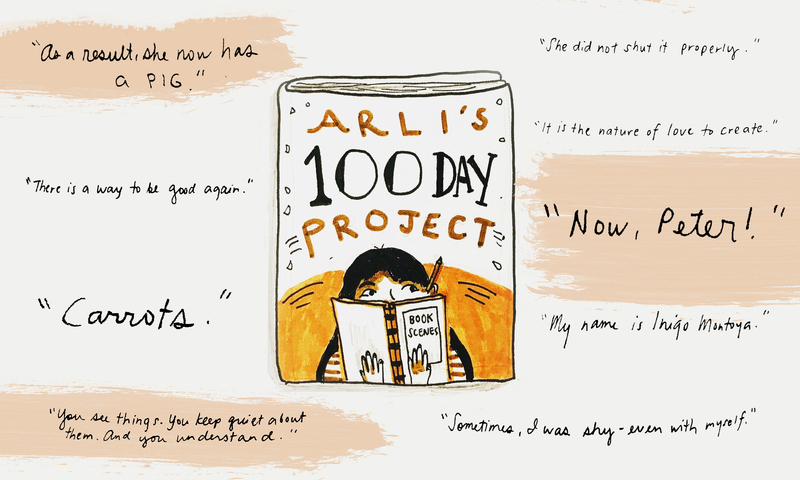 Produced by Arli Pagaduan, this project features—as the hashtag says—one book scene every day for 100 days. It might only be her Day 38 today, but already, her consistent streak of drawing and posting proves to be an impressive feat. Here, Arli talks about her creative process and favorite pieces. Arli Pagaduan is a writer and illustrator—essentially, a storyteller. Follow her @arlipagaduan. 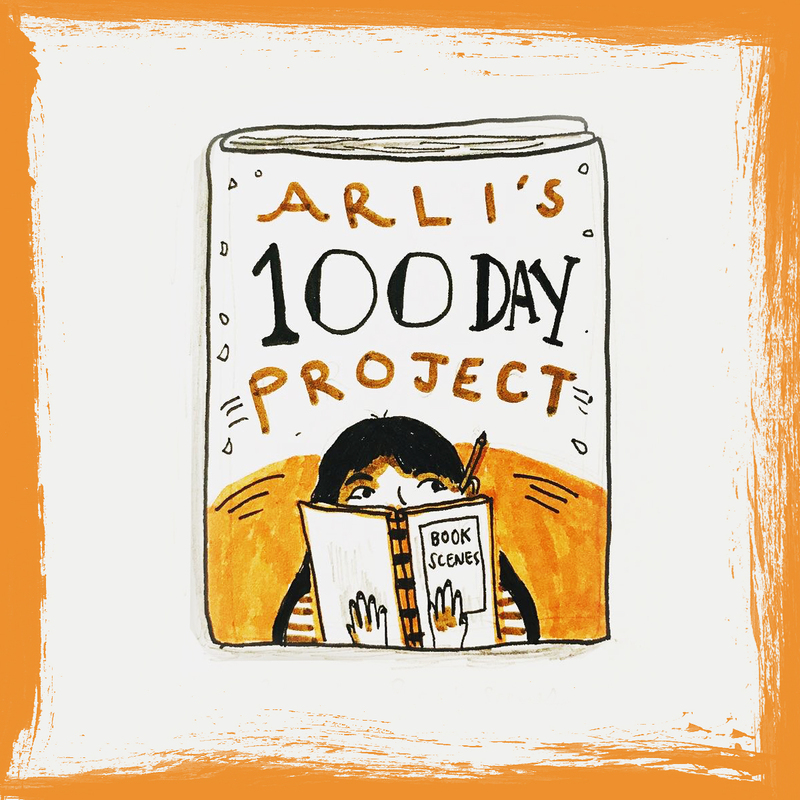 Arli’s Book Scenes for 100 Days—what a dream project! As a reader and as one of your followers (on Instagram, of course), it’s always exciting for me to see your posts come up on my feed. But I guess the important question is: how in the world do you choose that one special book scene to draw for the day? Thank you for the appreciation for my project, KB! I’ve always wanted to do something creative with the books I’ve read. This project was inspired by Elle Battung and her#100dayproject for books (#elledoes100favoritebooks), in which she did such beautiful tiny paintings of covers. For my own, I decided to do scenes from books I’ve read throughout the years from memory. Sometimes, I consult them again when I’m unsure about particular details. I choose the scenes that had the most impact on me. Prior to starting, I listed down all the books I’ve read and checked those I will be making scenes from. I draw mostly fiction, but there are non-fiction ones as well. What I draw for the day is random, and I make sure that no two books with the same author are posted consecutively, so there’s that element of surprise. If I posted Harry Potter and the Sorcerer’s Stone one day, I’ll draw Chamber of Secrets a few days or weeks after it. While I did plan out my books with a list, I didn’t follow it entirely throughout the weeks. I draw with what my gut tells me, trying to see if the scene and corresponding line relate to a current sentiment of mine, because I do like sharing reflections in the captions of my book scene posts. Creating art from the heart, it seems! So every day, you sit down and draw. How is that process like? Do you have a particular place and time for drawing? Do you bring around a notebook wherever you go and when an idea comes up, you just do it? Process is very important to me, and I put a lot of value, time and effort into it. That’s one of the best things of being an artist: getting to experience getting one’s hands dirty with paint or ink or pastel, and going through daily life just creating, completing, and sharing. It’s an intimate moment between the artwork and the artist. Mine starts with the birth of an idea and connecting it to another and another, until I have something that’s enough to create a story or illustration from. I start the day by reading one chapter/segment of books (something about creativity and something about self-growth) and then check emails and social media. After breakfast, that’s when I sketch and color the Book Scene for the Day. When I’m done with the drawing, I search on Goodreads or leaf through the book for a line to go with it, which is not necessarily related to what’s happening in the scene. The time really depends on what a certain project requires me to do. I don’t do any work past 8 p.m. because I value play and rest. But if I do, they are just tiny tasks that don’t take much time or brain work. I work where there is ample light: by our dining table on a clear and clean space. And yes, now that you’ve mentioned it, I do have notebooks with me and a working pen so that when an idea comes, I write it down before it goes away to where neglected ideas go! Putting aside the reading and writing tools, let’s move on to your drawing weapons. Is there any specific reason why you picked only three? For the watercolor markers, I chose Burnt Sienna similar to red orange, and Raw Umber which is like deep dark brown. I selected them for four reasons: 1) I like earth and warm colors; 2) watercolor markers appear bright on the sketchbook I’m using for the project; 3) earth colors remind me of old and wrinkled pages of books; and 4) Burnt Sienna and Raw Umber are the only watercolor markers I have (haha!). Out of what you have so far (about two-thirds to go until completion! ), which one is your favorite? Were there any that were super easy for you to create? My favorite would have to be the scene from The Perks of Being a Wallflower by Stephen Chbosky. I like how it turned out with Charlie at the back of a party, leaning on a wall, looking quite lost but still observant. I colored in the foreground of random people with umber and sienna, thus giving more focus on Charlie at the center. Dark and light contrasts. Coincidentally, I still do feel like a wallflower at times, and my shyness got in the way of making good friends before. Additionally, I like the scenes I did of books written by Filipinos, namely Love at First Run by Angel C. Aquino (read our review here), Choco Chip Hips by Agay Llanera and Ghost of a Feeling by Celestine Trinidad (read our review here). Oh, and the 2018 Newbery Medal winner, Hello, Universe, by Erin Entrada Kelly! Other favorites include Anne of Green Gables by L.M. Montgomery and those by Madeleine L’Engle, which are A Wrinkle in Time, A Wind in the Door and Meet the Austins. Meanwhile, the easiest to create were the ones I did not have to consult the book anymore, because the scenes remain so clear in my head, even though I read them when I was young! These include Stargirl by Jerry Spinelli, Matilda by Roald Dahl, The Secret Garden by Frances Hodgson Burnett, Bridge to Terabithia by Katherine Paterson’s Bridge, and of course, the Harry Potter series by J.K. Rowling. Any of those drawings that gave you a hard time? The Graveyard Book by Neil Gaiman, The Kite Runner by Khaled Hosseini, The Hitchhiker’s Guide to the Galaxy by Douglas Adam, and The Princess Bride by William Goldman—all fantastic books I need to reread! Everyday projects, no matter how exciting and fulfilling, can also be a real pain in the… neck. There are days you wake up and inspiration or motivation is gone. How do you deal with that? I do something unrelated like taking on chores, taking a walk, playing with our pets, or working out. I also listen to “Go the Distance” from Hercules on loop whenever I feel dejected or when I’m starting to lose heart and faith in my own abilities. That has always been a special song for me because it kind of became a beacon or sign of hope that I can truly do something meaningful with what I have been graciously given, that I can get to where I want to go, that I can become the person that I want to be. Other ways of getting back on track is to look at my old works and notebooks to see if something kicks me out of the rut! Has the possibility of not completing this project ever crossed your mind? I’d be so sad and disappointed! And I would probably berate myself internally for committing another old sin of starting something, building on it, pushing everything under the rug, and calling it a day! “I already made the mechanics simple for you, but you still didn’t finish it, Arli? !” Haha! But I don’t think that ‘lack of motivation’ would be the reason I do not complete it, if ever. It would likely be because I have more client work, org work or bigger personal projects to prioritize. Nevertheless, I stick to my belief that if I can do good work in the small things, then I can do it in the big things as well. I never really thought about celebrating after finishing it… Haha! Maybe the reward is the actual completion and the fulfillment of being able to commit to something and see it to its meaningful end. Looking back to the 100 days of making the book scenes would be a bonus—to be able to reflect on the intimate creative process between artist and artwork. The best thing for me, however, is that I am able to share about the books that I love. It’s always nice to have conversations about books. For instance, a cousin of mine played a guessing game as to which book a scene was based upon—and so far, she has been right on everything! By the end, I think I’ll celebrate by extending my gratitude to those who followed and supported this project. Speaking of projects, here’s something to daydream about: If you could collaborate with one of your favorite authors, who would you choose and why? What would you like for you two to do together? Arli is also an independently published author. Her works include Seedlings: A Short Story Collection (ebook available here), Surrender and Pinwheels. Watch out for her new short graphic novel to be released this 2018. Visit her website here and check out her merch store here.